Dare I say the profs (and Endemol) have also realised the value of keeping Yvane in to push up the viewing figures? Despite his non-voting rebellion, he managed to escape a final nomination this week. Also surviving the rattrapage this week: Julia and Harold. Let's hope it's a good one - particularly looking forward to Madcon, Sheryfa and Mathieu. ...it is now. Back to work tomorrow, prepare for happy-chilled-out-post-holiday mood to be smashed into a zillion pieces once more and after 5 minutes it'll feel like I've never been away. Over the coming weeks I'm about to launch yet again into self-imposed early curfews, no after-midnight blogging (except at weekends) and alleged healthy lifestyle, diet, walking, aerobics, step machine, water, fruit blah blah blah, as major work is needed to overturn 5lbs weight gained in Nice. Still, what an enjoyable way to gain weight, with all that lovely food and wine. Aah memories...But weight loss costs, and here's where I start paying, in sweat! 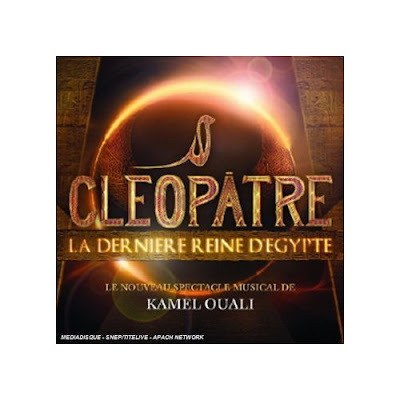 Album Review: "Cleopatre, La Derniere Reine D'Egypte" Original Soundtrack. One thing I’ve noticed about France over the last 10 years or so, is that they love their musicals. Firstly it was Starmania, then Notre Dame de Paris, and that paved the way for the massively successful Les Dix Commandements. What the latter proved was that a soundtrack album could be successful as a separate entity from the musical itself. Most recently, Le Roi Soleil produced a string of hit singles and has made stars out of Emmanuel Moire and Christophe Mae. Since the news leaked last year of a new project masterminded by top choreographer and Star Academy dance teacher, the lovely Kamel Ouali, we eagerly awaited the arrival of this new musical based on the Cleopatra legend. Of course a musical could succeed or fail based on casting choices but I feel they have made the right decision for this one: the leading lady is Moroccan-born Sofia Essaidi, who was a semi-finalist in Star Academy in 2003 and since that time she released an excellent debut album which I thought was vastly underrated. Sofia excelled as an all-round performer in Star Ac therefore it’s good to see her finally getting the starring role which she deserves. She has it all: looks, talent and a distinctive singing voice although she is not the type of singer usually associated with musical theatre. Many of the songs on this soundtrack have a very modern feel indeed: the first single, Sofia’s "Femme D’Aujourd’hui" was very ‘now’, with a musical similarity to "Umbrella" whilst the follow-up "Une Autre Vie" - a duet between Sofia and Florian Etienne, is musically reminiscent of Keane. The third, soon-to-be released single "Main Dans La Main" sunb by Mehdi Kerkouche would not seem out of place among the current crop of r’n’b tunes and I’m sure this will be a massive hit. Amelie Piovoso’s "Je Serai Ton Ombre" also has that r’n’b thing going on. I particularly like the stomping rocky number "L’Accord" and think this will work well on stage, likewise "Le Serment", a duet between Christopher Stills and Florian Etienne. There are also more traditional ballads but all in all it’s a more contemporary soundtrack than you would expect from a ‘musical’. Looking at the songwriters involved it’s certainly an impressive list: Blair MacKichan, Patrice Guirao, Lionel Florence, Stanislas, Benoit Poher and Souad Massi appear in the songwriting credits and all lend their distinctive styles: Massi’s "Tout Sera Stratageme" certainly boasts an ‘eastern feel’ and is a nice departure from the other tracks. Apart from Sofia, the troupe mainly consists of unknown names (to me anyway) although there is one familiar name - Christopher Stills, the son of very famous musical parents Stephen Stills and Veronique Sanson. I wonder if Florian Etienne, Mehdi Kerkouche, Dominique Magloire and Amelie Piovoso will become household names like their Le Roi Soleil predecessors? The verdict: this is a good album rather than a great one. It could be argued that it lacks the absolute showstoppers required of a musical soundtrack, and for that matter there is nothing as good as "Mon Essentiel" or "Etre a la Hauteur" or the tearjerking greatness of "Tant Qu’on Reve Encore". As an album of contemporary songs it certainly succeeds though: it will be interesting to see just how well they fit into the stage production which kicks off on 29th January 2009 in Paris. Or should I say Night 1, as our plane descended over the Med into Nice Airport as night was falling. When I said I loved everything about Nice, I lied: for I absolutely hate that descent. If you flew any lower over the sea you’d need a sea-plane. On the positive side, and I always like to think positive, the view is very stunning, you can see all along the Côte D’Azur from Cannes via Villeneuve-Loubet to Nice. Just try not to remember you’re about what feels like ten feet above the sea. Have decided the best (and cheapest) way to get from the airport to the city centre is by the no.98 bus, costs just 4 euros and takes you all the way along the Promenade des Anglais before making its way to the Gare Routiere - bus station. Our journey lasted about 15 minutes and we then took the short walk to our very centrally located hotel. It's a warm night, but not excessively so. After unpacking and getting the air conditioning to work - an easier task than usual - we headed back out for a meal. Rue Masséna has always been one of our favourite streets in Nice, as it boasts a fine combination of shopping and eating. One restaurant after another, so much to choose from, and it was inevitable that we’d end up there tonight. These restaurants mainly focus on pizza, pasta and seafood. Decided to go Niçoise with spaghetti au pistou, basically spaghetti in an olive oil and basil sauce. Oh, and some Provence red wine. Here’s to massive weight gain and goodbye to any progress that I’ve made on Weight Watchers over recent weeks. Why are the people of Nice so slim with all that lovely food all swimming in olive oil???? The biggest change in Nice is the introduction of the tram system. More about that in the coming days. On to another one of our favourite old bars before heading back to the hotel. The great thing about Nice is that being there feels like home. Only with warmer weather, better-looking people, better food....you get the idea. Third visit, and the magic is still there. ..."If Only You" the hit single by Danny Saucedo, that is. Too bad if you don't like that song and you live in Sweden, as it was that country's most-played song on the radio over the past year, played no less than 95,062 times and counting. At least it wasn't "Chasing Cars" or "I Kissed A Girl" or "No Air" which must have been played on every radio station in the world about a million times now. I happen to like "If Only You" so I thought it was worth a mention here. It wasn't just an airplay hit in Sweden: during my trip to Riga in May it was all over the radio then as well. Over recent months checking my Sitemeter stats it didn't escape my attention that one of this blog's big faves Vincent Pontare has been one of the most searched-for artists, and I was very interested to read that he, along with Sophia Somajo and Michael Zitron, wrote "If Only You". No news yet on any new material from Vincent, all we know is that he's been writing his second album and in the meantime became very popular in Germany with the wonderful "Miss Blue". These are not the best of times for Star Academy, with the French media reporting that viewing figures of both the weekly prime gala and the daily updates are plummeting in freefall, and the show doesn’t command the audience share that it once did. Thankfully the hideous jury idea has been dropped this year and Star Ac has gone back to basics, with three nominees, one being saved by the public and one by the students, leaving one student each week to be eliminated. The students are also marked by the profs’ panel (Armande, Kamel, Anne, Dominique, Rafael and Philippe) during the prime. This is not a full review but only edited highlights as I only watched about three-quarters of the prime, it feels as if it goes on for hours now and that would try the patience of even the biggest Star Ac fan! The second prime of this series kicked off with the students, minus the nominees, performing "Superstar", the new theme tune. Harold and Joanna duetted on "Ain’t No Mountain High Enough" and these two vocally are streets ahead of the other students, a situation very reminiscent of Star Ac 4 when Gregory and Hoda were clear front-runners from the beginning. But we know what happened to Hoda...anyway it was 14.7 for Harold and a big 16 for Joanna. Bit of controversy this week as new prof, singing teacher Anne Ducros was clearly out to make a name for herself, refusing to mark Yvane for his rapped contribution to "American Boy" only for Yvane, Star Ac’s answer to Sean Paul, to demonstrate some showstopping freestyling and earn an average of 15. Ms Ducros is annoying me already. She is not Raphie and should stop trying to be. A romance is always a good ratings grabber, and Alice would be yet another in a long line of blonde female wannabes inventing some love action to keep them in (SA5’s Maud & Jeremy, SA6’s Faustine & Brice, and at least half of the contestants who’ve ever been on Big Brother). Alice, nominated this week, shamelessly and embarrassingly milked her ‘romance’ with Gautier during her nomination song "Oh". According to French internet sources, mean moody rock boy Gautier with the lip piercing and the permanent scowl would appear to be the ‘chosen one’ this year. To his credit he gave a surprisingly mature and assured performance this week, earning 15.5. An extended - no make that interminable - version of "Rockollection" with Laurent Voulzy and the students. Julia, Anissa and Joanna gave us "I’m Outta Love". They were also outta Anastacia, who cancelled her appearance due to illness, and on this one Julia was outta her depth, getting 13 with Anissa getting 15.2 even though I thought she performed better on "Mercy" with Duffy. Indeed singing with Duffy may be a good thing, as Julia also did better with her. I find Edouard quite likeable now, and thought he sang well on his duet with William Balde on "Rayon de Soleil" and thought he deserved more than the 13.7 mark awarded. Maryline could also be a dark horse and she got the tableau this week, did quite well too with 14.8. Laure was average on her nomination song and her mark of 12.5 reflected that fact. Much more entertaining was Gaetan who makes up for lack of singing talent with bags of personality and 14 wasn’t a bad mark for him. Mickels singing Radiohead got him 14; Ana got 14.3; and Solene earned 15.2. Quentin, for such a young man, has a great feel for variete francaise, if his faultless rendition of "Partir" in duet with Julien Clerc was anything to go by. The profs thought so too, awarding him this week’s top mark of 16.2. And so to the vote. The viewers saved Alice, leaving the students to choose whether to save Gaetan or Laure. For the first time in eight series, a student refused to cast their vote. Guess who: yes that student was Yvane ‘the rebel’, and he will probably pay for this. Or maybe not: he’s controversial, and controversy might just pull some viewers in. Some medieval Breton rap for a Saturday night....and why not! "La Tribu de Dana" was the big song in summer 1998, the first year I went to France on holiday, so what better reason than to commemorate the 10th anniversary of their hit, and my holiday, by featuring them tonight. Neil Hannon is probably one of the most underrated musical geniuses of the 1990s. Tracklister recently mentioned this and it seemed to set off a major chain of events in my memory bank. Ahead-of-its-time instrumental with some maximum-Moog action. And they were French, which falls very nicely into the EuropeCrazy remit indeed. Because it's old, there's no video but if you go to http://www.youtube.com/watch?v=vzuUJPbnU6A you can have a listen and enjoy its wonderful-ness. Here are a few songs which will always remind me of Nice! Beggin' - Madcon: already one of my firm faves this year (and a major tip for my 2007-50) and seemingly the French agree. This. Was. Everywhere. Disturbia - Rihanna: another holiday, another Rihanna song. The 53rd track to be released from her interminable "Good Girl Gone Bad" collection, but a refreshing electro diversion from the formulaic r'n'b which she was sinking into. So What - Pink: Any break-up song which starts with the lines "I guess I just lost my husband/I don't know where he went" should not be taken too seriously, and this tongue-firmly-in-cheek comeback from Pink ticks all the boxes. Just Dance - Lady GaGa: I didn't think too much of this track for a while but it finally won me over last week. Massive hit in France over recent weeks/months with huge hit potential - will this be another one to miss out in the UK? C'est Beau La Bourgeoisie - Kylian Mash & Laurent Konrad: gold-digging disco anthem. French dance music is on a real high at the moment and this bi-lingual track, all over the radio at the moment, is yet another example. C'est Ma Terre - Christophe Mae: from forthcoming live album, another nice summery acoustic track from the former "Le Roi Soleil" star. I can only really stick him in small doses but this Afro-themed song certainly appealed to me last week when I heard it a lot. Si C'est Une Ile - Jenifer: I found her new 'rock' direction a bit hard to take, but this is much much better than "Comme Un Hic" (which I hated, to be honest) but this guitar-driven song rattles along at a very nice pace and it grows on me with every listen. Mes Insomnies - Louisy Joseph: rather good slice of reggae-flavoured pop from the ex-L5 singer. Sounded very good on the radio. I Want You - Martin Solveig: like I said, French dance music is on a high and here is one of its biggest hitters. Tomorrow Can Wait - David Guetta: ditto. Guetta is a real superstar of French dance music, this is also due a UK release and should take him back into the top 40. Next Plane Home - Daniel Powter: slaying the one-hit-wonder ghost of "Bad Day" - this is getting major airplay in France and is a guaranteed hit. Beat on the Brat - The Ramones: for reasons known only to myself and faithful travelling companion, this song will always be associated with Nice 2008. Enough said. Rayon de Soleil - William Balde: the undisputed hit of summer 2008 in France, and still picking up a lot of airplay. Comme Avant - Sheryfa Luna & Mathieu Edward: rather lovely duet from Popstars winner and Star Ac 7 runner up. Aftonbladet reports this week that 3440 songs have been entered for next year's Melodifestivalen. SVT are certainly going all-out to ensure that Sweden does better next year. In other news Aftonbladet reports that there will be an overhaul of the joker/wildcard system. SVT will now hand-pick big-name songwriters/producers (names quoted include Idol judges Anders Bagge & Andreas Carlsson, also Bloodshy & Avant) and they, rather than SVT, will choose the artist to sing their song. Off to the big city today with faithful travelling companion for lunch and shopping. As usual this meant hanging out in numerous bookshops and record shops. My excitement went through the roof, when I saw BWO's "Pandemonium" on display! In a previous post I happened to mention about vinyl records making a comeback and I saw more of them than ever today - even Joy Division's "Closer" which I bought all those years ago and still have in my collection. Have decided am definitely not getting rid of 14 year old hi-fi with turntable and double cassette deck and (temperamental/malfunctioning) CD player and may instead just invest in one of these micro hi-fi thingies with (non-temperamental, non-malfunctioning) CD player and iPod dock. Aftonbladet reports that the new album by everyone's favourite Idol runner-up, Darin, will be released on 03.12.08, the title is "Flashback". It will be preceded by the first single "Breathing Your Love" on 13.10.08. Poster Girl has kept us up to date as ever with what's going on in the Swedish music scene and she recently mentioned the return of Sebastian Karlsson. The video for his comeback single "My Getaway" can be seen over at Aftonbladet. The video has lots of close-up loveliness of the man himself and the song has builds in a kind of similar brooding style to Martin Stenmarck's "7milakliv" (the original, not the fab dancey remix thing) and if I have any criticism it's that it takes just a bit too long to get going, but I'm now onto my third listen and it's growing on me now. Lena and Orup: "Nu När Du Gått" sounded really familiar and listening to it again I now realise why: "The Sweet Escape", anyone? Verdict on first couple of hearings: it's OK, nice pop song but not fantastic like it should have been. Maybe the album will be better. This weekend: some stuff about Nice. Last week's prime of course featured this year's 'godmother' Rihanna and 'godfather' Christophe Maé. A good mix of the old and new, something for everyone there! It's early days and I don't have a clear favourite, but I think that Joanna, Gautier and Harold could all be in with a chance. P.S. Meant to say there's a new theme tune "Superstar (That's What You Are)" by the Merrymakers. This replaces Bob Sinclar's fab "Love Generation" which was the theme tune from 2005-2007, and that replaced "Run Baby Run" by Bustafunk which was the theme tune for the first four seasons. Yes incredibly this is the eighth edition of the French reality-pop-talent show, possibly rumoured to be the last. But then they say that every year don't they! Major changes this year, as there is a new directrice: Armande Altai, previously one of the "profs" on earlier series, replaces Alexia Laroche-Joubert, who decided to quit the show. Also following her out were Matthieu Gonet and notably Raphaelle Ricci, who was always the most outspoken, passionate and controversial of the profs. Hers will be particularly big shoes to fill. So there are a number of new profs this year but good old Kamel Ouali is still there - this brilliant choreorgrapher's dance routines set the prime apart from every other talent show of this type. To the uninitiated, Star Academy is Idol-meets-Big Brother, and it's as much about the friendships, relationships and conflicts which develop between the contestants, inevitably a group of reasonably attractive young people, who live together in the academy. Even the location this year has changed: no longer the chateau at Dammarie-les-Lys but a smaller building situated in the Marais district of Paris. The first Prime took place last Friday, and there was a surprise as four students were immediately nominated - Julia, Gaetan, Laure and Alice. Julia was saved in the 'rattrapage' and so the three students facing this week's public vote are Gaetan, Laure and Alice. I've watched this show for long enough now to know that the first couple of weeks it doesn't really matter that much who goes. However I'm glad that Julia's been saved. During the initial couple of daily shows it looked already as if she was being edited to look like a bit of a troublemaker, and she did seem to have a bit of a personality which is more than can be said for some! I haven't heard many of them actually sing yet, so I can't really comment yet on who my favourites are!! I only hope that it will be a good contest this year and that it produces a worthy winner. Fingers crossed yet again..
Much as I'd have loved to stay on the Cote d'Azur (half a million euros for a flat in the centre of Nice permitting), I decided to come back home after all !! Star Academy is also back, and I managed to catch a couple of daily episodes before leaving Nice. Updates also coming soon. Yes it seems no time since my last holiday but I'm off on another one tomorrow. It will be our third summer holiday in this great city: firstly 2003, then 2005 and now 2008. Hoping for some dry weather and sunshine as we've forgotten what that looks like. I wonder how much the place has changed in the last 3 years. Obviously the tramway is now up and running, and the Place Massena is no longer a building site but a beautiful square again. There will be a daily diary which I'll publish on my return and hopefully a few 'nice' (pardon the pun) photos to go with it. For anyone not familiar with Nice, it's certainly a very photogenic city. And let's just say that many of its inhabitants are, how shall I say, very easy on the eye! Anyway this will be my last posting until Tuesday 23rd September so until then au revoir mes blogging amis.....! Anyone remember this over-hyped band from the mid-90s with the ridiculous name? Previously featured the original incarnation of German ZTT act Propaganda on here before, however they did evolve (for want of a better word): same name, different band. There was a new singer - Betsi Miller, replacing the legendary Claudia Brucken, and the line-up included two ex members of Simple Minds. The newer, more 'radio-friendly' Propaganda released "Heaven Give Me Words", in 1990, which was co-written by Howard Jones (who I was never a fan of), but I thought this was quite a nice record although admittedly nowhere near the dizzy heights of "Dr Mabuse" or "Duel" or their fantastic debut album "A Secret Wish" which was full of fantastic 80s German synth-pop. OK folks - ready for a bit of the old Retro Saturday??? As you know I usually go for my more obscure favourites on a Saturday night but as I'm listening to a few of my favourite Prince tracks on iTunes tonight I thought I'd feature him as part of Retro Saturday. Hard to believe it's almost 25 years since he took over our charts. To some, Prince was (and is) one of the greatest musical geniuses of recent times; to others he was just the "Purple Pain" but I just happen to think he made some brilliant records for a while. Well it's not so much this week's playlist as what I've been listening to over the last 3 or 4 weeks. The Bells of Freedom - BWO: as I once again moan constantly about the UK's refusal to accept arguably Europe's greatest pop band right now, I totally love this anthemic little number and it has a really funny camp video too. Smilin' - Bryn Christopher: I'll need to have a listen to his album - still loving this track but why the low chart position? Next Plane Home - Daniel Powter: it wasn't easy for him to follow up "Bad Day" - the most played song on British radio of the last five years - but this is a nice radio-friendly comeback and hopefully it will banish his one-hit-wonder tag. Spiralling - Keane: it took a long time for me to get into this song and it's only now I'm beginning to appreciate it. Not, apparently, indicative of the other tracks on their forthcoming third album. Before The Worst/Rusty Halo - The Script: two tracks I particularly like from their amazingly self-assured debut album. What You Look For - Sam Beeton: I should really hate this kind of thing, and I probably will end up hating it, but in the meantime it's just a slice of catchy guitar-pop from a very young-looking new singer-songwriter. Save The Lies/Don't Want To Go To Bed Now/Got No Place To Go - Gabriella Cilmi: I really like this girl's debut album "Lessons To Be Learned" and these are three tracks I play a lot from it. Who Do You Think You're Foolin'/We Do Do You - Rongedal: back on the playlist, some dangerously catchy pop from the Swedish brothers. Divine - Sebastien Tellier: this refuses to leave my ears alone! One of the best European tracks of the year. Are we still here then? It's scary stuff, this 'big bang' experiment which is going on in Switzerland this morning. I don't really understand any of it, nor do I really want to, but I'm surprised that the boffins behind all this nonsense were allowed to carry out such a ludicrous experiment. The lengths that people go to for a Nobel Prize! I see that the national nominees for best act from different countries across Europe are now listed for voting at the MTV Europe Music Awards website http://ema.mtv.co.uk/ whoever wins each national category will then battle it out against each other. I haven't got time tonight to list all of the nominees from everywhere, but here are some. If you go to the MTV EMA website and click the link to voting then scroll down to the bottom right side of the page there is a drop-down picklist of all the countries from which you should be able to find the various national nominees. ...till I'm off on holiday to Nice. Which is a warm and sunny place. Unlike home where the temperature is cold, and the weather is wet. I was walking back to work after lunch today, dressed in my big full-length winter-weight parka (yes! It’s that cold! ), plugged into the iPod as usual. "Le Soleil Donne", by Laurent Voulzy, one of the most summery records ever, came on. The irony of this was not lost on me. Anyway I was having a little pre-packing party at EuropeCrazy HQ, trying on and selecting the clothes I’m taking with me next week. I had the Rongedal album on and really enjoyed listening to that again. Once the decision was made it was on with the case packing. That’s most of it done tonight, yes I know it’s almost a week to go but I was never one of those throw-everything-into-a-case-the-night-before-you-go people. Trust me though, I will have forgotten something...! I've just been reading through the list of this year's MTV Video Music Award winners. A rather uninspiring bunch if you ask me, what's with all the Britney-mania again? (Although credit should go to Robyn for lifting "Piece of Me" out of the ordinary). Anyway great to see Tokio Hotel getting the Best New Act prize. Europe loves them and now so does America - so when is Britain going to wake up??? The second annual Eurovision Dance Contest took place at the SECC in Glasgow on Saturday night. I've done a few rather blurry screencaps to illustrate this review, it's not the easiest thing in the world to photograph dancers !! The hosts were Graham Norton (oh just go on and give him the Wogan Eurovision gig why don’t you, BBC) and Claudia Winkleman (one of the many annoying British TV-females who shamble along in a consistently embarrassing fashion.) Her dress was also shockingly wrong - we couldn’t decide if she was either a descendant of the hunchback of Notre Dame, or she was ready to go into labour. Thankfully she changed into a better dress later on for the voting. The pre-song postcards were very good too, featuring a bit of background about each pro-celebrity dance couple. The rules this year had changed, as every couple had to have a professional dancer and a non-professional. Some non-professionals were very 'professional' indeed though - we were impressed by the standard tonight. Firstly, Sweden, represented by Danny Saucedo and his partner Jeanette (pictured above). A good start, although in places Danny appeared curiously static in their dance to "Hung Up". First on is a poor draw position though, and this was maybe reflected in the holding-back score of 31 from the neutral international jury. Incidentally, I wish the contestants’ names had been displayed on screen and not just their countries! Austria next (pictured above) with a musical and dancing mixed bag ranging from The Third Man to You Can’t Touch This. They were good fun though, and he kept up that deadpan humour all night, even to those interviews in the green room. 21 points from the jury - no wonder he was deadpan. On to Denmark, OMG it’s the Twin Peaks theme!! It’s those trousers and bare feet from the lyrical routines on "So You Think You Can Dance" but although that’s not my type of dancing, they were excellent. So fast that they're a blur! (see above) Best so far. The jury thought so too, awarding 48 points. Britain’s TV commentators were Craig Revel Horwood and Len Goodman from the "Strictly Come Dancing" panel. At this point their commentary was irritating me as much as Ms Winkleman’s frock, but as the night went on I quite enjoyed some of their biting sarcasm. Newcomers Azerbaijan - with the first professional male dancer of the night - made their mark with a routine to "Phantom of the Opera" and had the ultimate publicity stunt as he proposed to her following their dance which got 42 points from the jury. Ireland gave us a Riverdance-fusion routine spoiled by awful music which didn’t go with the dancing. 29 points from the jury, which was about right I guess. Last year’s inaugural winners Finland came back with that most Finnish of dances - the tango, which is a national speciality in that northern country. However, the actress/dancer combination performed well but it was a bit too clinical and lacking in passion. 34 points awarded. The Netherlands provided a twist. He’s a singer, and he’s singing "Angels" instead. Or at least a bit of it. He was a little static though, and the jury wasn’t too impressed either - 28 points. Lithuania - the female half of the duo was the first of many to go down the Bucks Fizz route (i.e. Taking off one garment to reveal another) This was a routine of two halves, with the second half being more rewarding. She was good though for a non-professional. Revel Horwood: "I didn’t like it (the gimmick)" Goodman: "A lot of people don’t like you!" The jury liked it though: 42 points. And so to Royaume-Uni, represented by Louisa Lytton and Vincent Simone (pictured above). I’m not being patriotic but I thought they were excellent in their sharp, speedy and dramatic routine to Lee Mead’s version of "Paint It Black". They also went down the dress-ripping Bucks Fizz route. They were undermarked - no, make that robbed - by the jury, I thought. It deserved much more than 34 points. Next, Russia. Just the mere presence of Russia would be enough of course to guarantee a high placing. Cynical, moi? They were very good though - she’s an ex-Olympic figure skating champion. However I didn’t like their music and the whole thing was a bit overloaded, all drama and throwing their arms around. Commentator "Uncle Len" didn’t like it, but the jury did - 42 points. I’m not sure if the people of Greece would be too happy to have two Aussies representing them, although I suppose it doesn't really matter - half of the British couple was Italian after all! Like most of the acts it was a bit of a fusion of styles, and I thought it lacked cohesion however the jury liked them and gave them 44. Goodman: "Never trust a man with a sequinned tattoo". The Portuguese couple looked very nice and danced a dramatic and skilful routine. She’s a fado singer incidentally. Horwood was grumpy about this, but I thought they were undermarked - only 30 - and there was the odd boo heard from the crowd in response to this low mark. Poland were in with a good chance with their crowd-pleasing routine dancing to Michael Jackson’s "Black or White". Another dress-rip routine. They were very good and the jury thought so too - 40 marks - but best of the night? I didn’t think so. You couldn't write them off though - and dancing second from last was a dream draw. Finally, Ukraine. She was a gymnast and it showed. Yet another crowd-pleasing routine - a mix of jive and folk (!) They both looked as if they were having fun. Revel Horwood: "too cheesy and open-gobbed". Following all the dances there was a behind-the-scenes feature which showed Glasgow off very well, and there was another chance to see all of the dancers perform in a group number before the voting started. The interval act was a good opporunity to go off and do something else. Was Lesley Garrett and the ensemble cast of "Carousel" the best that the Beeb could do? Definitely not my taste - I’d have preferred if, say, they’d got the Joseph and Maria finalists for a medley of musical theatre hits. On with the voting. I had hoped that the combination of a professional jury system (awarding 25% of the final mark) combined with a reduced number of competitors (14 countries) would maybe help to avoid the neighbour/diaspora voting which has dragged the song contest down in recent years. Umm....no. Ireland (wasn’t that Brian Ormond from Pop Idol 2 giving the votes? ): 12 to Poland. And so on. By 10.00 pm Poland were running - or should I say dancing - away with it. Carol Smillie - herself an ex-Strictly Come Dancing contestant - delivered the UK vote which predictably threw 12 points at Poland, and subsequent votes from other juries delivered the Polish couple victory. Yes they were good, but you can only wonder if their high votes across Europe could be attributed to the Polish migrant workers’ communities across the continent, who may just have realised the power of the diaspora vote. If that is indeed the case - everyone will have their own view on the matter - then, possibly, get ready for a Polish victory at next year’s ESC. Don’t think this is sour grapes - I’m not in the business of sour grapes when it comes to any of these contests, and was watching Saturday's show as a determinedly neutral Eurocentric viewer - but it only leaves a bad taste when something as non-political as singing and now dancing becomes an international political barometer of who your friends and neighbours are. Have a look at the final scoreboard (above): the ‘Western’ countries are now firmly in the "no one likes us" camp. Possibly one of the best British Eurovision entries that never was!! So as I was saying, this was my other disco-dancing party piece - in those days every song ever written seemed to have a disco-cover-version, but Amii's "Knock On Wood" seems to have lasted the course. She is one of the underrated disco queens of that era, as her next move was to cover "Light My Fire" in her inimitable disco style. Back in the day: 1979 to be precise, this was my little disco-dancing party piece (my other little disco-dancing party piece will follow next). For something on our own doorstep there has been virtually no coverage (at least none that I’m aware of) about the Eurovision Dance Contest which is taking place tomorrow at the SECC in Glasgow. Two things I do know: 1) the UK will be represented by that little fireball Louisa Lytton (from the series before last of Strictly Come Dancing) and her dancing partner Vincent Simone, dancing a paso doble/tango to Lee Mead’s version of "Paint It Black": fingers crossed that they do it justice. They are drawn 9th out of 14 contestants. 2) Sweden will be represented by ex-Idol contestant and rather fab pop star Danny Saucedo, currently one-third of "Jennie Let Me Love You" hitmakers E.M.D., and dancing partner Jeanette Carlsson, dancing a cha-cha. And they’re on first, not a good draw. Usually Friday night is when I get to spend a bit of quality time with faithful travelling companion, however in time-honoured fashion he has caught a pre-holiday cold and I don't want to catch it, so he's quarantined for one week only!! What is this girl to do? OK then...a bit of blogging I think! I'll watch some more of those Swedish Idol audition videos too. After Orup writing songs for Lena Philipsson, then the pair's popular live stage show, what next? Aftonbladet gave us the answer today. The two Swedish singers have teamed up again - for an album of duets! According to Orup, Lena has written half of the new songs on the album. First single (no title as yet) is out on 22 September with the album to follow a month or so later. I like both Lena and Orup but I'm not really sure about this - the word 'duet' conjures up sheer horror for me - however I'm sure with their combined songwriting and singing talent they should come up with something rather special. Where I live, it has probably rained every day for about the last six months, ok maybe there was one dry day along the way?? Anyway I was checking the forecast for Nice (ok I know it's a bit early but just out of curiosity...) to find those little black clouds with the two raindrops, not just the little black cloud with the one raindrop. That's heavy showers folks, however unlike at home where the temperature is dropping, over in Nice, il fait chaud. It always does, particularly when we're off there on holiday. Well it can be chaud if it wants I guess (Being fair skinned I don't purposely sunbathe but got the factor 40 suncream packed away) but that heavy rain - non, non, non! My holiday preparations are progressing nicely. Just need to get some more Euros - how shocking is that pounds to Euros exchange rate? I feel a bit of bankruptcy coming on...! Two weeks to go till I head off on holiday, and I've discovered a rather fab blog about one of my most favourite holiday destinations. Nice Daily Photo (http://nicedailyphoto.blogspot.com) which literally does what it says on the tin - a different high quality photo every day which gives a fascinating insight into this wonderful city resort. I see that the 2008 MTV Europe Music Awards (EMAs) have been announced. Just been to have a look at their website. They don't seem to be doing New Sounds of Europe this year but will have a Regional Award category and the winners from each territory will fight it out for the title of Europe's Favourite. Hopefully there will be some inspired choices in this category like last year, I also enjoyed the daily knockout eliminations in New Sounds of Europe and hope they'll do it the same way this year. The EMAs will take place in Liverpool on 6 November. I've been checking out various European singles charts and couldn't fail to notice just how similar they all are. So leaving aside the varying merits of Rihanna, Katy Perry, Kid Rock, Coldplay, Duffy and Jordin Sparks, it's refreshing to see that the Norwegian singles chart contains a number of homegrown hits. "If A Song Could Get Me You" - Marit Larsen: this is topping the charts at the moment and is a nice quirky little acoustic ballad, like Lene Marlin overdosing on the happy pills. It's rather sweet, but maybe a little too sweet at times, but it makes for an interesting no.1 single choice. "Lost" - Erlend Bratland: a "....Talent" guy I presume? No, it's not a cover of the Michael Buble song, and yes, it does sound like a talent show contestant's song. "Scared of Heights" - Espen Lind: I've followed his work on and off for a few years, good to see he's still going. This is a nice jaunty little acoustic ballad, which the Norwegians seem to be rather fond of at the moment. It's a little Jason Mraz-esque (and coincidentally "I'm Yours" is no.5). "Belly Up" - Maria Mena: I'm not really familiar with her work so I don't know if this is good or not by her standards. It's certainly a bit offbeat and unusual for the top 40. "As I Am" - Inglow: this is the kind of melodic easy on the ear rock which will definitely appeal to fans of Tokio Hotel or Takida. I'm hoping to do Norwegian charts updates more regularly - their singles chart certainly appears more interesting than I thought it would be!